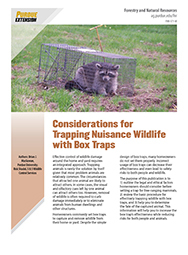 Homeowners commonly set box traps to capture and remove wildlife from their home or yard. Setting a box trap improperly can decrease their effectiveness and even lead to safety risks to both people and wildlife. The purpose of this publication is to 1) outline the legal and ethical factors homeowners should consider before setting a trap, 2) review the basic procedure for effectively trapping wildlife, and 3) help you to determine the fate of the captured animal.